1. Dental bonding: This is carried out to fill gaps in the teeth and cover stains and chips. The process involves the application of a composite resin material to the tooth. The material, which is available in several shades, is sculpted to cover the desired area. It is then dried using a high-intensity light or a chemical. The process does not cause any discomfort to the patient except when a minor tooth roughening is done. Dental bonding does not require more than one visit to the dentist and is relatively inexpensive as compared to other dental restoration techniques. 2. Tooth contouring and reshaping: This quick, inexpensive, and non-invasive procedure is used to fix dental issues such as overlaps, shallow pits and grooves in the enamel, worn edges, and chipped teeth. The dentist uses a polishing instrument for the removal of a tiny amount of enamel and the tooth is reformed. The enamel removal procedure is carried out only after dentists confirm through x-rays that the teeth requiring reshaping are strong enough to withstand some enamel loss. The process is completed with the smoothing and polishing of the edges of the newly contoured tooth. The process usually requires a follow-up visit after the first visit. 3. Mouth guards and night guards: These are plastic appliances that offer protection to the mouth during sports and also while sleeping. Mouth guards disperse shock caused by violent contact and thus protect the head and neck. They are prepared using a cast of the teeth. The mouth guards can be stock, mouth-formed, or custom-made. Night guards prevent bruxing between teeth during sleep. They are ideal for people with worn teeth, those who suffer aches in the jaws, and people with teeth that are sensitive to cold. 4. Halitosis or bad breath: The breakdown of food particles by the bacteria present under plaque, in the crevices on the tongue, and between teeth leads to the generation of volatile sulfur compounds (VSC) that cause bad breath. Periodontal disease is also a cause of halitosis. Dentists determine the amount of VSC being generated by using a halimeter. Treatment usually involves following a prescribed oral hygiene routine that may include the use of irrigators, artificial saliva, tongue scrapers, etc. 5. Tooth whitening: This treatment is useful for removing stains that appear due to the consumption to tea, coffee, cigarettes, and wine. 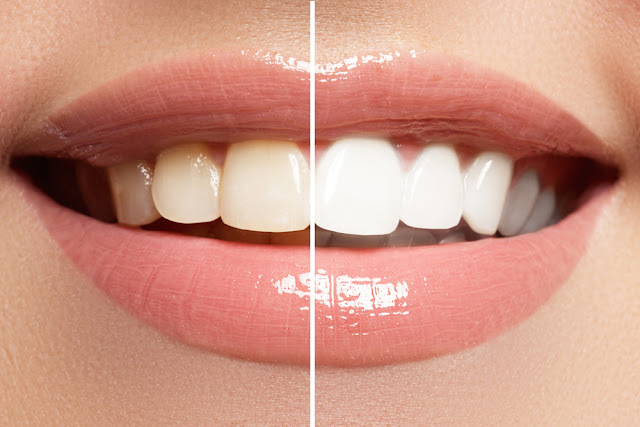 Whitening is carried out using bleaching gel, which is usually hydrogen or carbamide peroxide. The gel breaks down releasing oxygen molecules that penetrate the enamel and dentin and disintegrate the stains. The time required for results to appear depends upon the source of the stain and varies from a few hours to a few weeks. 6. Crowns and bridges: Teeth that need repair after an accident or excessive decay can be treated by using a crown, which is an artificial replacement for the upper portion of the tooth. A bridge involves placing an alternate tooth that is held in place using two crowns that are bonded on adjacent teeth.